This media analysis has been built around the Social Model of Communication, shown below (Figure 1.3). “The social model sees communication as both structured by and contingent on some shared social element or space” (Gasher et al 13). This structure of communication is centred around the idea that senders and receivers of information are inextricably linked to their shared realities and life perspectives; also known as their “universes of understanding”. This helps us to understand media by seeing it as a complex communication. Gasher, Skinner, and Lorimer. Mass Communication in Canada. 8th edition, Oxford University Press Canada 2016. 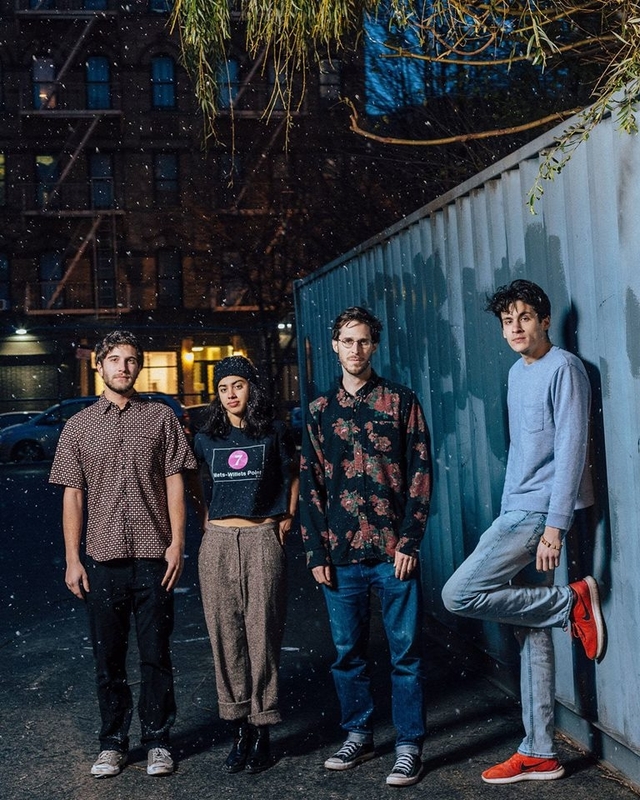 I chose a music video released by the band Crumb in March of 2018 for their song “Locket”. It can be found at https://www.youtube.com/watch?v=BqnG_Ei35JE and was directed and edited by Haoyan of America. In this music video, a group of young adults (including the four band members) are seen playing around with different objects such as books plastic lizards and video games while sharing mugs of an unknown beverage. I believe that the intended message in this video is that perspective shapes reality, which can be shared yet deeply personal. According to the online Cambridge Dictionary, perspective is “a particular way of viewing things that depends on one’s experience and personality”. In this video, the lead singer is the central perceiver of their group hang-out, which involves quite a few different perspectives and her active examination of them. It is clear to me that many things can be trippy and psychedelic without involving psychedelic drugs, so I’m not going to go into the mysterious beverage that all the YouTube comments are raving about. To demonstrate this idea of the power of perspective to shape reality, the encoder of this video uses shifting camera perspectives, repetition around eyes and eyeglasses as well as the use of books as props throughout. Constantly shifting perspectives are central in this video and edited in a psychedelic way to shape the viewing experience. The video starts with some mind-bending close-ups, shown quickly flashing in sequence. In the first 36 seconds, there are 42 of these close-up perspectives. This gives a personal feel and induces a variety of images into the viewer’s mind: immediately pulling them into the reality that the video portrays. These shots then shift to a more flowing viewpoint of the lead singer moving throughout the house from the perspective of a 360-degree camera. Besides the shifting camera itself, there are shots throughout of a real fishbowl. This is a classic comment on perspective, since the viewer can see clearly everything inside the bowl, but of course, not the fish’s viewpoint. It goes well with the use of the 360-degree camera. Further, throughout the video, there are many shots involving eyes and eyeglasses. A fundamental and inseparable part of seeing the world around us is that we are seeing it from a certain perspective or vantage point. This is literally built into the human experience. I think of the classic adage about wearing rose-coloured glasses, which implies that the colour of glass in front of the eyes can (and does) alter a perspective. Similarly, glasses are used here to show a shift in perspective. At the beginning of the film, a few of the people are shown wearing dark glasses. Their darkness implies something is not being seen, vision as obscured or a perspective dulled. Near the end, one of the people is shown in the same spot, no longer wearing glasses and the other is shown close up removing hers, signalling a shift in perspective. The neat video effect of eyes expanding is also used, as well as other close-ups of eyes. Their repetition signals the same thing. Then there’s the use of books as props throughout, a few of which are recognizable. Clearly visible are a few optical illusion books as well as the famous book by Ram Dass called “Be Here Now”. This is a widely popular book of which I am a major fan, a spiritual classic all about perspective. Books are widely symbolic for learning, known to allow one to garner new perspectives of understanding. Books have a special way of shaping reality. Now that I’ve broken down some of the main symbols used to demonstrate what I see as the preferred meaning for this media, I’ll go a bit more in-depth on how the preferred meaning can be plugged into the structure of the Social Model of Communication. As shown above, the model starts with the encoding context, also referred to in the structure as the encoder’s universe of understanding. This affects all levels of the media, comparable is being the source of the media. As I said, the video is directed by Haoyan of America. I explored their website, Vimeo page and Youtube channel. I was unable to find out much about their situational dynamics, outlook or culture, though it seems this person has an open-minded creative ideology. I say this based partly on the visibly unusual style of cinematography they are creating. All of their videos make deep and memorable statements which lend themselves to a creatively minded creator. There was one particular piece of information I found on their website that gave me a clue about their ideologies and perhaps understandings. On Haoyan’s website, the page labelled “&mpersand“ has a snippet from a book- the introduction to which is written by Terence Mckenna (who is one of my biggest inspirations). According to Wikipedia, he was “an American ethnobotanist, mystic, psychonaut, lecturer, author, and an advocate for the responsible use of naturally occurring psychedelic plants.” His lectures are widely available on YouTube and I’ve been listening to and studying his work since I was 17. In the snippet Haoyan uses, Mckenna writes of being spoken to by the spirit of the magic mushroom and its communication about the evolutionary capacities of the human species. For a lot of people, this is extremely ‘far-out’, so it is very telling that Haoyan has used this as the only information that isn’t business oriented. Due to the depth of McKenna’s words, I feel that this found information contributes to Haoyan’s universe of understanding- one that is open to the many perspectives available in the universe and one that spends time portraying the beautiful strangeness of our reality. Next is the decoding context: my universe of understanding, which results in a decoded message unique to me. The first time I watched this music video I was alone at home on a sunny afternoon, sitting on the couch with my laptop. I recall searching for the video in order to share the song on my Facebook page because I had fallen in love with their music. That day I was feeling particularly centred, easily grateful for the abundance our western world has provided me. In terms of social class, I sit in the middle. I am a white, English speaking, privileged young person identified as female. My life has been very easily accessible, a life of ease concerning survival and luxury. My personal universe of understanding is very much centred around the exploration of consciousness and meditation practice. I am spiritual and I understand life as such. I am creatively open-minded, an explorer, a learner and a grower. I am deeply connected with my purpose, which is oriented towards advancing myself and so contributing healing to the world. Now for my take-home message, aka the decoded content resulting from the personal context I just explained. To me, this music video hints at the concept of being one with everything. To be one with the universe is considered to be a final ‘destination’ in many ancient spiritual philosophies. For me, the understanding of being one with everything means to see myself as all things and all things as myself. It is to see oneself as the universe, with no boundaries between the contents. This perspective is liberating, boundary-dissolving and for me, deeply interesting to contemplate. I can see the lead singer symbolically experiencing the perspective of oneness here and throughout the video. She is often shown holding or viewing a glass sphere, containing the little world of the house she is exploring. This is symbolic of oneness because of how a perspective is shrunk into this individual, singular glass sphere that contains all things she is seeing and experiencing (which she can then close her hand around as if her own). When I feel at one with the universe, I feel kind of like the glass sphere looks: integrated and whole. This feeling is empowering and a great example of how powerful perspective is in shaping reality, as it 100% does change how I view everything in my life. There’s also the scene of her in profile view with another scene imposed onto the inside of her head, which could be seen as having the world inside herself. As I mentioned, they also included a copy of “Be Here Now” by Ram Dass- not once, but three times. It appears at the following time signatures: 2:19, 2:31 and 3:03. It took me a few times to notice, but I certainly get the feeling that it’s a hint. I’m sure someone involved in the video made the decision to have that placed there for good reason. This book is about a main principle of meditation, being here now (being with what IS) and dissolving the ego in order to see clearly that there is no separation between self and other. The above photo of a page in the book directly references this concept in relation to Buddhism’s Four Noble Truths. The lofty beliefs put forward in this book centred around oneness with all things make it undeniable that there’s an abundance of conscious messages in the video. This book can’t be read without catching a glimpse into the perspective of oneness! Overall, I decode this video as a visual depiction of how perspective shapes reality. It invites the viewer to go deeper, to see a reality in which we are all one; each being in the universe as complete and inseparable. I can see how this perspective is unique to my decoding context, which perhaps has similarities with the encoder’s encoding context. This interpretation is important because of my inherent value as a human and as a receiver of this meaningful media. It is also important because it has affected me and my life, reminding me of the vast community that exists of which I am a part (and in which infinite perspectives are contained). I hope that you, my readers, will listen to Crumb’s most recent album. Mostly though, I hope the idea of being one with everything will be planted in your mind as something to contemplate as you go about your daily, ever-changing existence. I hope also that you will take the reigns on your moment to moment internal perspectives and play with how they shape your reality. Gasher, Skinner and Lorimer. Mass Communication in Canada. 8th edition, Oxford University Press Canada 2016. All GIFs and Screenshots credited to above music video.